Well I hope you all had a very happy holiday – however you may have celebrated. I was here at home with The management and Jess for the duration (having delivered the geographically distant family members gifts weeks ago). It has been wonderful to have my husband and daughter with me for a few days – but I am a solitary beast and have been looking forward to having some time alone again. Anyhoo, during the time I have been able to sit around doing very little – and let me tell you I made the very most of this – I finished off the Lemongrass sweater I have been knitting. The pattern has turned out to be just as adorable as I had hoped, and whilst Jess said she liked it my mother didn’t seem too impressed with the picture I showed her when I visited. Ah well, you can’t please everyone. Well now for the details. As previously mentioned this was knitted from a pattern found on the Ravelry site, in Drops Nepal which I bought from the Wool Warehouse. 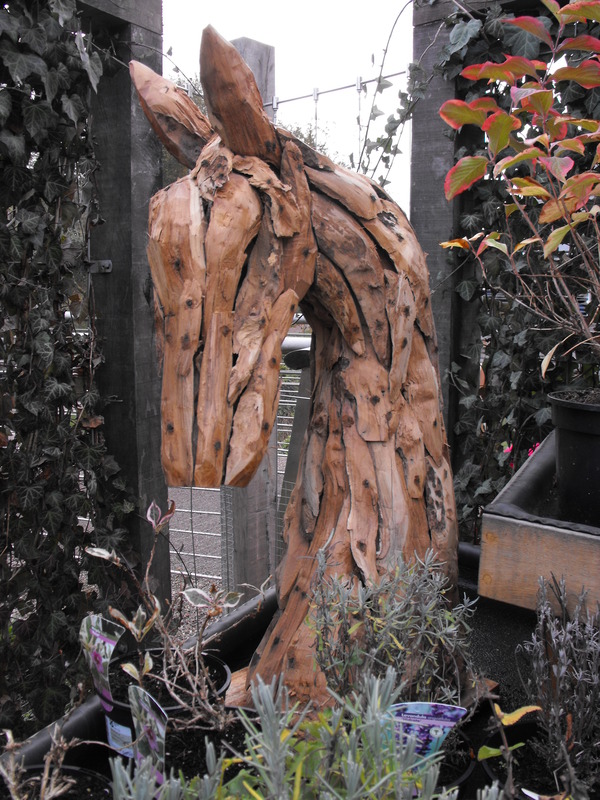 I was lucky enough to get it at 25% off but I think that finishes tomorrow (31/12/15). I had hoped that the alpaca bit of the mix would make the wool less ‘scratchy’ on my neck as I am very sensitive to that but it still seems to be a little itchy. Maybe that will be better after the sweater has been laundered. I knitted the pattern pretty much as printed, but I didn’t make the buttonholes in the front band as I really couldn’t see the point. I sewed the buttons through both layers and they are just fine. I sewed 4 buttons rather than the original two for no particular reason. Actually, I probably used four because I just loved the buttons which I bought last year(?) at the Kendal Wool Gathering. I did wonder about knitting this a fraction longer but I am very happy with the length it turned out – I am 5’4″ tall just in case you need to consider this for your garment should you decide to make it. If I make this again I might make the collar/neckline slightly shorter to stand up without a fold, or another couple of inches longer to make a good fold. At the moment it isn’t clear quite what it wants to do. I love my new sweater, and might well make this pattern again. I love having something on the needles through winter evenings so will be looking for another project pronto. I haven’t really felt like sewing, and since I didn’t have any client work needing attention I have taken a step away from the machines. Isn’t it strange how you start to twitch a bit when the sewing urge comes back? Trousers next time. These were finished almost a week ago and I have finally given up waiting to have someone available to take the pictures and resorted to the tripod. Aaargh. Anyhoo, let me introduce the snaky jeans. This fabric had been in my stash for an embarrassing length of time so when my eye was drawn to a pair of snake print trousers in Bazaar magazine I knew it’s time had come. Some might say it ought to have been saved for Jungle January over on the Pretty Grievances blog (yes, it is happening again in 2015) but I have actually got a pearl of a fabric in store for that! I knew exactly what changes I wanted to make to the last pair (which have been worn and washed like mad) so I was able to just cut out and put the pedal to the metal all the way to finish. This was also helped by having bought the Advanced Industry techniques class from Craftsy in their last big sale. (More on the class at a later date). This brings my GAM target up to 7 – only 5 left if I am to finish this year. And only 21 days. Hmmm. Don’t ever let anyone say I can’t stick to a project. This one was started months ago. (In May – shocking huh?). 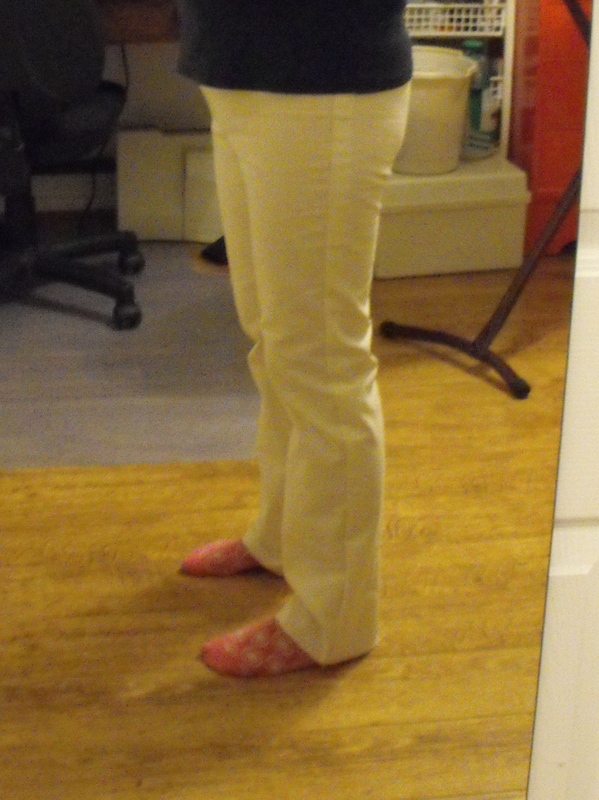 But now I have finally finished my first pair of jeans from the Craftsy Jeanius course. And I like them! I am counting them as my 6th garment in the GAM Challenge and I know I have some catching up to do. About six weeks left to make another six garments – not terribly likely but I can try to make some, even if I can’t make them all. 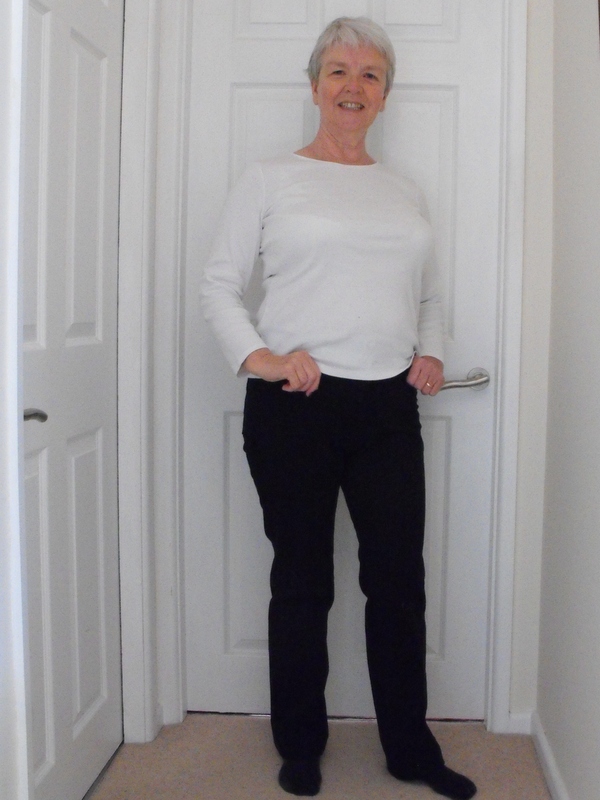 I bought the course with the intention of copying a pair of Max Mara Weekend jeans that I wore loads last year but when I tried them on they didn’t look as good as my faithful Marks&Spencer Per Una everyday jeans.The Management said so so it must be true – he doesn’t often offer an opinion. The Craftsy method of providing video tuition that you can access whenever it suits you is good for me. I learn visually, so it helps that I can see someone actually demonstrating a process. As an experienced dressmaker the demonstrations (not just in this course) are sometimes a bit ‘fullsome’ but this will no doubt be of great help to a novice tackling the project for the first time. Again I came away with new toys (my pressing dept. has been expanded) and I am looking for another couple of things which Kenneth D King makes look indispensable – I will let you know how I get on. The method he showed to get an accurate copy of your garment was really good – and in no way tied to jeans. I have already used this method to copy a clients jacket for her. Score. I even made a muslin after making the jeans pattern. 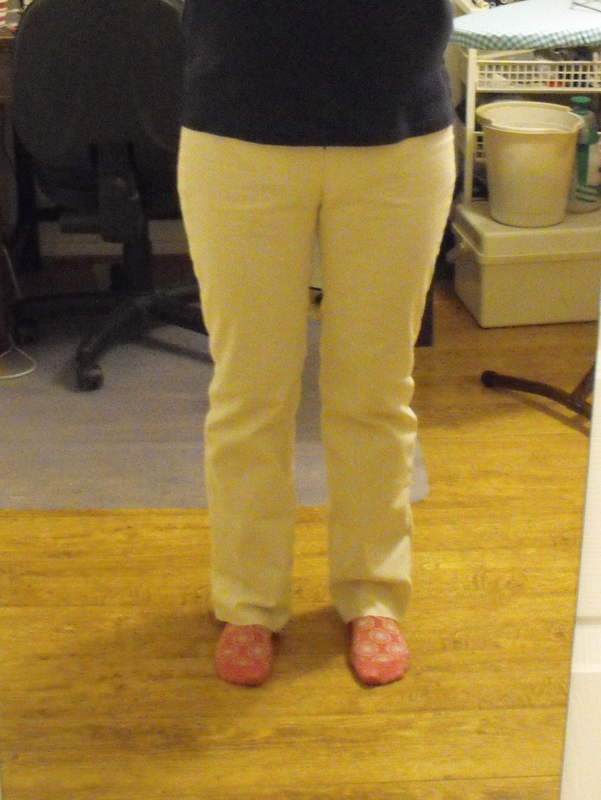 I just forgot that the jeans were stretch denim and that calico doesn’t stretch. Did I mention how long I have been sewing? Despite the lack of stretch I was able to get into these, and even fasten the zipper. I was fairly happy with the fit (giving some consideration to how it would translate into my stretch denim) so I went ahead and cut it out in some black which had matured sufficiently in the stash. I like it but don’t love it so wasn’t going to be broken-hearted if it didn’t live up to my hopes. In the interest of learning I followed Mr Kings instructions precisely – except for the pocket which was different in my jeans – and ended up with a pair of jeans I am happy to wear. 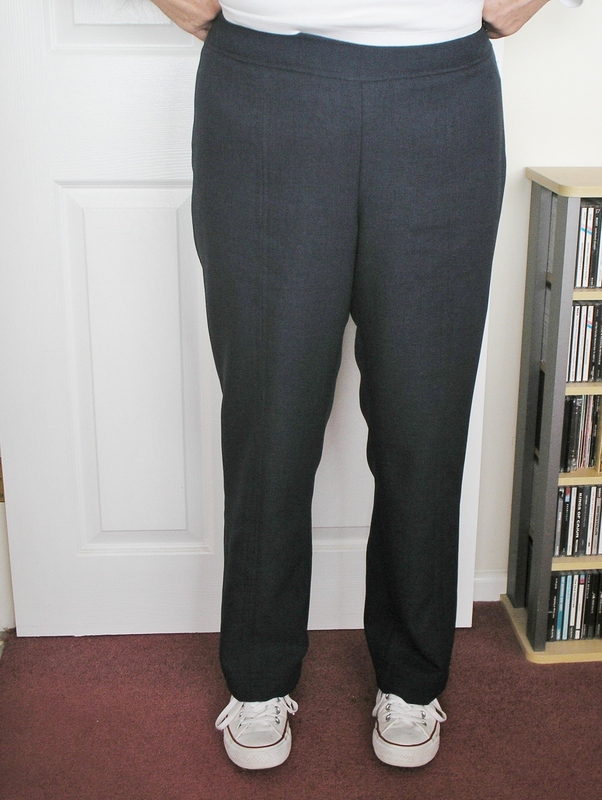 Changes on the next pair – use my method of installing the zipper which hides a bit further back in the fly front, use his pocket method as I think it may sit better than mine. Everything else worked well – I loved his method of working the waistband which makes a straight piece into a curve, and the pocket support. I wore these all day yesterday and they are just like the original so I am very happy. Sadly black really doesn’t photograph well so you will have to take my word on the fit being pretty good. I already have the next fabric washed ready to cut out so I guess this has to be considered a success. I bought the course on sale so I am a very happy bunny! The course is on sale again at the moment – 34% off – if you are inspired. I don’t have any affiliation with Craftsy – I am just a satisfied student. On a totally different matter The Management and I had a day out at Dunham Massey (another National Trust property) recently and I saw this sculpture. Isn’t it just gorgeous? I can barely believe that it is already the 18th May. It has been busy here Chez Hood, and in addition to client work I have had a wonderful house guest as my dear old Mother-In-Law has been to stay. Now that is all wonderful, we even had a trip to Stratford to see Henry IV Part 1 at the RSC (Wonderful dahlings!) with dinner after, but it isn’t getting my sewing done. I have made a start watching the wonderful Kenneth D Kings Jeanius course, and I have to say I am enjoying it enormously. Quite a lot of what I have seen is basic practice when you have been sewing for decades but you never stop learning – and few sewers think they don’t need to know any more. Sewing is the sort of thing where it is always possible to learn something both new and amazing. Sadly, I haven’t got any further than watching (but I hope to get the trousers prepared for copying this week – honest!). However, I did make another incarnation of the Drape Drape t-shirt that was so nearly right – but not quite. 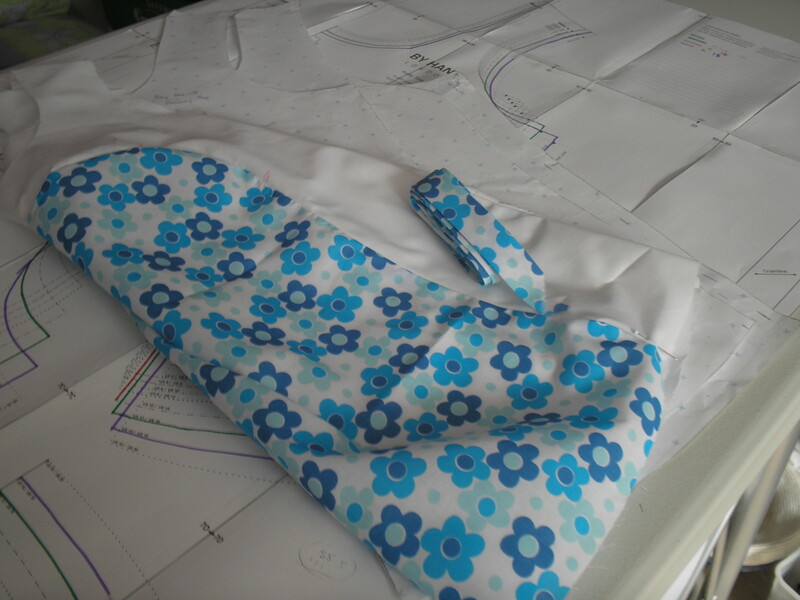 I made the adaptions to the pattern soon after the last effort was made so that I didn’t forget anything I wanted to do. That meant that I was ready to go as soon as I found a suitable stretch fabric to make up. A trip to Birmingham (whilst collecting the aforementioned MIL from her train) meant I was able to buy a suitable, but not expensive – this was still a try out – fabric. Once settled with pattern pressed flat (yes, I folded it for storage) and fabric ready I think this project was done in under 2 hours using the overlocker and coverstitcher. 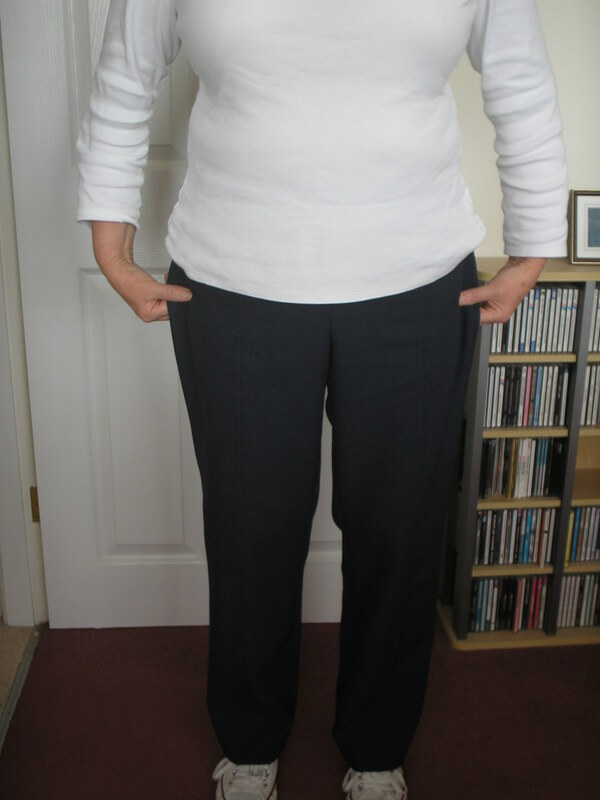 I raised the neckline 10cm which means it is now decent (although if you aren’t careful you could probably still ‘flash’), and reduced the size overall. I wish I could say how I did that but I’m afraid it was just a bit of ‘fiddling’ with the original copy shop print. I had traced two sizes onto the piece I took to be enlarged and this incarnation is around the smaller size – but with some alterations. I will never be able to repeat the pattern if I lose the one I now have! 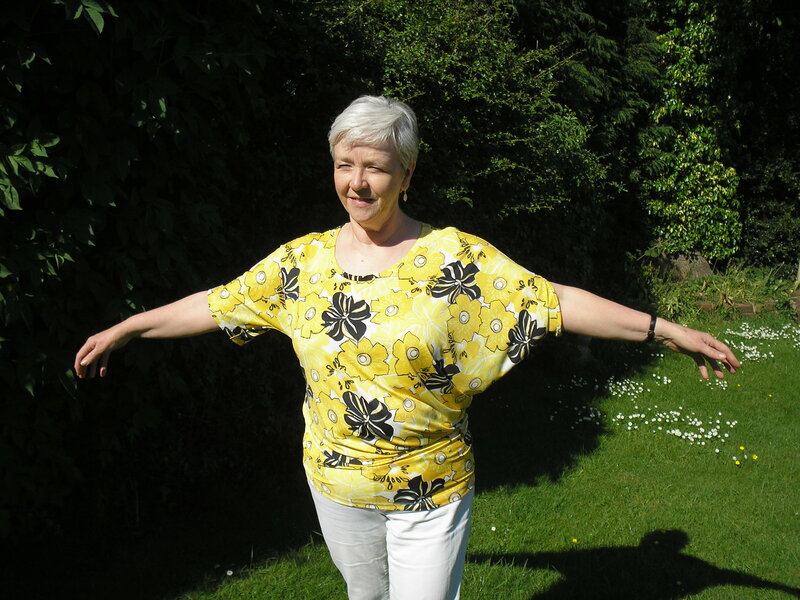 The fabric is just a four way stretch polyester jersey in another of my ‘shy, retiring’ prints! The lady in the shop has also bought this with the intention of making a holiday garment. I have to say it is perfect sunshine clothing, and I suspect this will be washed and worn to death over this coming summer. (Yes I know, I am an optimist but I am sure this will be a good one!). Sorry for that title but I couldn’t help myself. I was supposed to be stash diving and making up my mind what I wanted to make in May over this weekend but instead I spent most of it outside in my very neglected garden. All of my muscles are aching but the garden is looking infinitely better, and I even took all the rubbish to the tip today so I feel as if I have completed the task. Whoever called these long weekends ‘holidays’ was obviously having a laugh. Anyhoo, the May GAM choice. 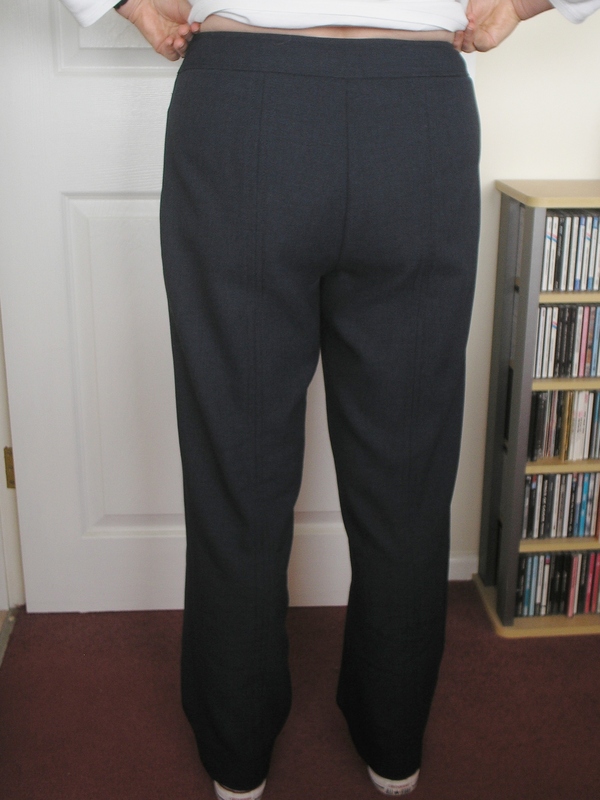 I have several pairs of Max Mara trousers/jeans which are now looking a bit sad. They were all bought at deep discount whilst I worked for a ladies dress shop doing their alterations ‘in house’. 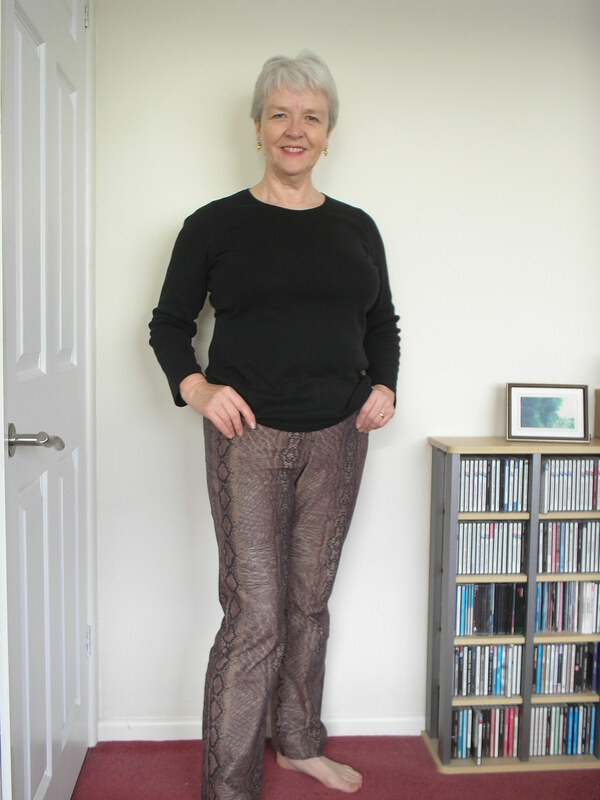 I have been very reluctant to throw them away despite their decrepitude as they fit me so well – Max Mara clearly suit ladies with ill defined waists and small hips. So I am going to use this as an excuse to do the Kenneth D King ‘Jeanius’ Craftsy course that I have had lined up for ages . Honestly, it has been waiting patiently for so long it is embarrassing. I have seen several reports where people have successfully used this course to reproduce their favourite jeans so I have fairly high hopes of getting a replacement for the shabbiest pair of Max Mara Weekend jeans. I still have to choose a fabric. I am hopping between the brown fabric I bought in Spain many years ago, which will give an almost identical garment to the one to be copied, or the yellow fabric I think will just be fun. Any suggestions?